Before learning a lot about self harm behaviour in teens, the term self harm was just related to the words “suicidal, depressed, self-hating, to me. There are many misconceptions about self harm behaviour in teens is and isn’t. And I will do my best here to demystify the term “Self Harm”, so that you can better help your teen when/if this issue arises. Self-harm behaviour in teens is not uncommon, anywhere from 7% to 24% of youth ages 11 years and older report engaging in some type of self harm. Self harm behaviour in teens is not the same as attempting suicide. Most self-harming behaviour is considered Non-Suicidal Self Injury (NSSI), Where the person inflicting injury on themselves doesn’t have suicidal intent. * Cutting, often to the arms using razors, blades, or broken glass. *Burning using cigarettes or coustic agents. Data shows self-harm has increased rapidly over the last two decades, indicating arise in stress, mental disorders and changing lifestyle and behavioural patterns. Rates of self-reported Non-Suicidal self injurious behaviour (33.8%) and Self-Injurious acts with associated suicidal intent(6.8%), Where females were more likely to have Self-harm with suicidal intent compared to males. 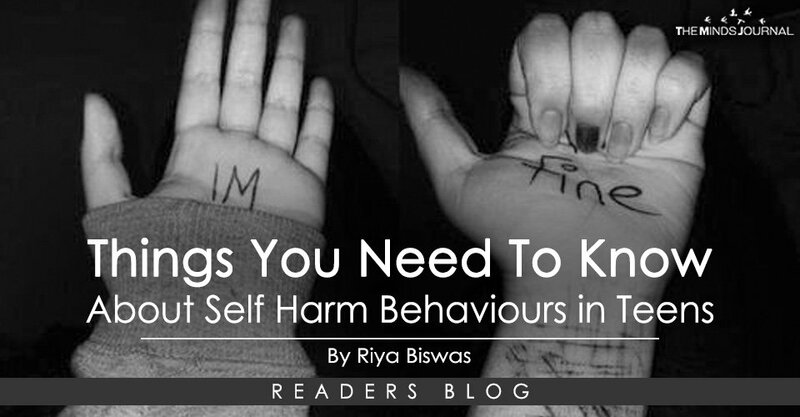 Self-harm behaviour is something to be taken seriously. Even though most teens and young adults who engage in self-harm do not intend to kill themselves, they are at an increased risk of having suicidal feelings and need to receive treatment to learn alternative coping skills and to connect with the underlying emotions. * Ask; Don’t be afraid to ask questions, “Do you self injure”? *Don’t make him or her feel ashamed or guilty about the behaviour. *Ask if they want to talk about it- forcing them will be a disaster. *Don’t embarrass them by telling your friends and relatives- Put your teens feeling first. And last but not the least, the best thing you can do is to seek help from a trusted professional so that your teen has an outlet to talk about some of the stressors in their lives and to learn healthy behaviour to deal with these stressors rather than resorting to hurting themselves.